Whirled Traveler: Oh, the places I have been! ... And have fallen behind in blogging about. Luckily, I have photos that keep me from forgetting places, people and details, so I can still recount trips somewhat accurately. I've been very busy on the trails lately, trying to recover from a nasty cold and regain my fitness. 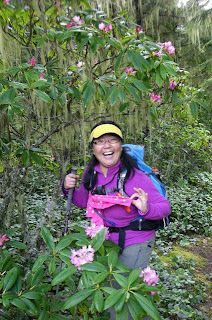 It started out with a hike through the wild Rhodies on the Tubal Cain Mine trail in the Olympics on June 24. This is the area where a bunch of excellent hikes start, including the Upper Dungeness River, Royal Basin and Marmot Pass – you just can't go wrong. The drive up to the trailhead answered our question of whether we were going to see the Rhodies in bloom or not. And two of us, Ming and I, had dressed for the occasion, wearing purple so as to match the flowers.We took the side trip to see the old B-17 that had crashed there in 1952 and had lunch under the cover of trees during a shower. On Saturday, June 30, I helped a fellow hiker earn his wings as a trip leader for the Mountaineers. It was not an easy feat to be hike leader on that trip, either, as there was a group of four non-members (invited by a member) who acted as though they were on a Meetup hike and were nearly independent of our group. Plus, despite two reminders from the hike leader-to-be Garrett, two of that group defied his requests and wore tennis shoes and cotton. The forecast was for rain and possible thunderstorms, oh joy! 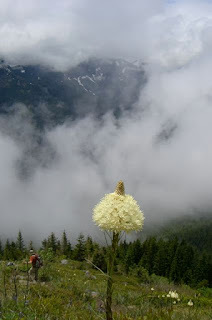 Luckily, the weather held and we summitted Bandera Mt with a view to nearby peaks, enjoyed some flowers and made it back down before the rain started to fall. Although it would have been nice to drive home the point of wearing appropriate clothing and footwear (while watching the two people shiver), we considered ourselves lucky to have avoided any bad situations. A few days later, on the 4th of July, a notoriously poor weather day for the area for as long as I can remember living here, we were blessed with blue skies and warm temps while hiking to Myrtle Lake in the Alpine Lakes Wilderness. We were a group of 8 Mountaineers, whittled down from 12 by colds (still going around, no doubt). I made sure to score a spot in Nicole's truck so I could "woof, woof" as we sped up the Middle Fork Snoqulamie Rd. No need for that, as she drove at 40mph on her own accord. We waited for the other car to catch up while we wandered around the river's edge, then all headed up the trail. The trail starts in 2nd growth, with rough spots of rocks and roots, then crests a ridge, enters the Alpine Lakes Wilderness and moves through old growth. 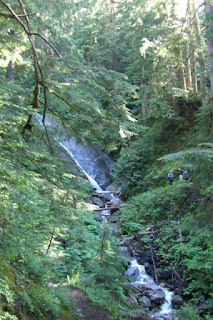 A beautiful trail, made even more fun with several creek crossings, most of which were easy. The lingering snow reported by a group 2 weeks prior had melted and so when we arrived at the lake, I was ready for a swim. 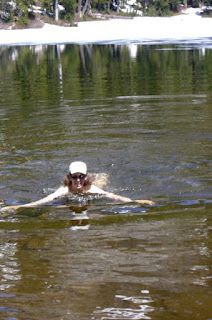 There was still a segment of frozen lake, but I tested the shallow water and declared, "I'm going in!". 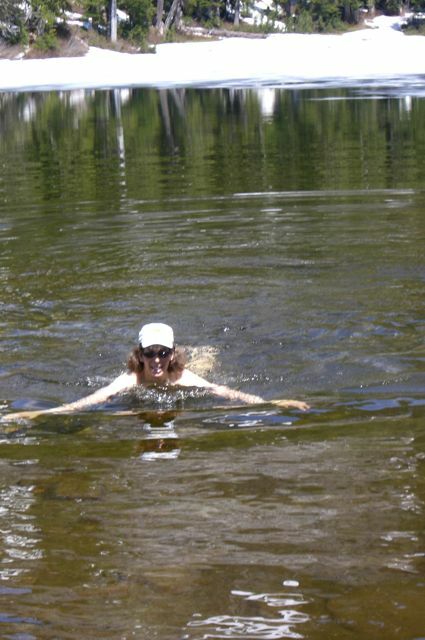 Everyone readied their cameras, Terry produced a small towel and I had my first swim of the season in the books. Nicole, my co-leader, followed my lead and cemented the idea that Mountaineers hike leaders are fun people (or maybe crazy people, depending on your perspective). On the following Sunday, we were again 8 people and Nicole was leading us to Malcolm Mt. On Wednesday, she had said to me, "I'll swim in lakes with you, if you climb peaks with me". 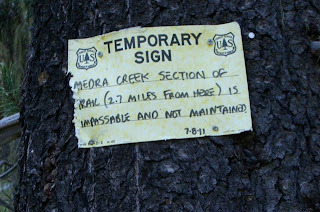 I agreed and we set out up the trail, but first we read a sign put up by the Forest (no)Service that said the Medra Pass trail was impassable 2.7 miles up and was dated exactly one year ago, 7.8.11. Since it was a loop, we decided we should come upon the impassable part early on, so we headed up counter-clockwise toward Medra Pass, trying to think what obstacle we couldn't overcome. It was bad enough that it was already in the upper 80s at just 9AM. What other difficulties were we going to have to face? I wish I hadn't asked that, as soon it was a game of Trail – No – Trail: we would find a trail and follow it over scree and steep rock, then it would peter out in the woods. Then, we would stick to the ridgetop where we could navigate better, but come across a dense patch of brush. I wondered what types of animals had made each of these trails, though the goat trails were obvious and our boots were no match for the sure-footedness of those cloven hooves. Along the way, however, there were a lot of beautiful and sometimes rare flowers to ease our pain. When we finally found a trail that might-could-possibly lead us to Malcolm Mt's summit, many of us were so low on water that to extend ourselves any further would surely mean running out of water before reaching a creek down below. Nicole was very generous in denying herself the summit to save her group from suffering, but I think it was the best thing for her to do. When we did finally make it to water, we all dunked body parts and clothing and celebrated as though we had been in the desert for 40 days. Once back at the cars, I pulled out some cold beer and juice from my cooler and Terry handed out wipes while we celebrated some more. 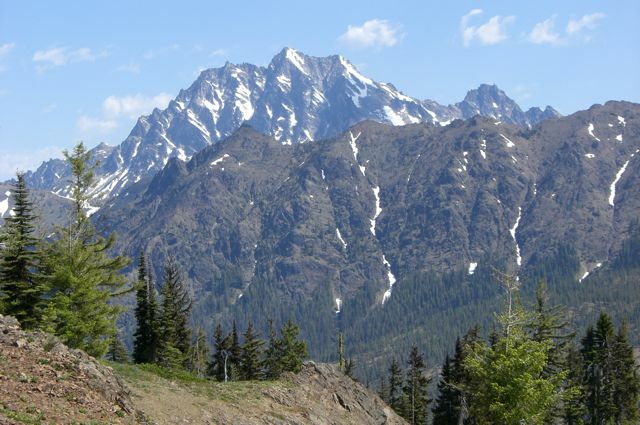 The total distance was 12 miles, with nearly 4,000 feet of gain in 92-degree heat.